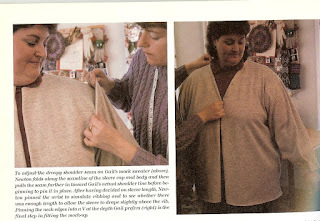 The way most sewers learn about fitting garments is by carefully examining the item on the body and making adjustments. I mentioned in my last post that sewers often make a test garment before cutting into their expensive fabric. Sometimes we use a plain cheap fabric, some use gingham because you can see the verticals and horizontals so clearly. 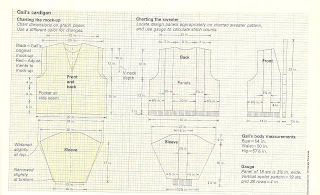 No hems, outside seam lines or facings are added so the finished lines of the garment can be assessed. Knitters can do exactly the same thing. Deborah Newton has an article in an old Threads magazine where she demonstrated the process. Fashion Doesn't Stop at 40 Inches Issue 18 1998. Here's Deborah making mockup out of T-shirt fabric. It's best to start with a knit fabric when doing this. Here's the pattern schematic created from the fitting. You can see how non-standard the shapes are. The article is also available in this book. Recently a knitting friend sent me a link to this blog post. I checked the writers "about me" page and see she included seamstress in her description of herself. I wasn't surprised, creating a paper pattern to understand construction is a "sewerly" thing to do. Unfortunately the only way to learn to think about garments more three dimensionally is to just do it. I once did a quarter size mock up in fabric to help a friend who couldn't figure out how to seam an unusual shape. We slipped it over a bottle as a stand in for a body. She was very surprised at how quickly it solved the problem and said she had wasted hours trying to figure it out with the pieces laid flat on a table. 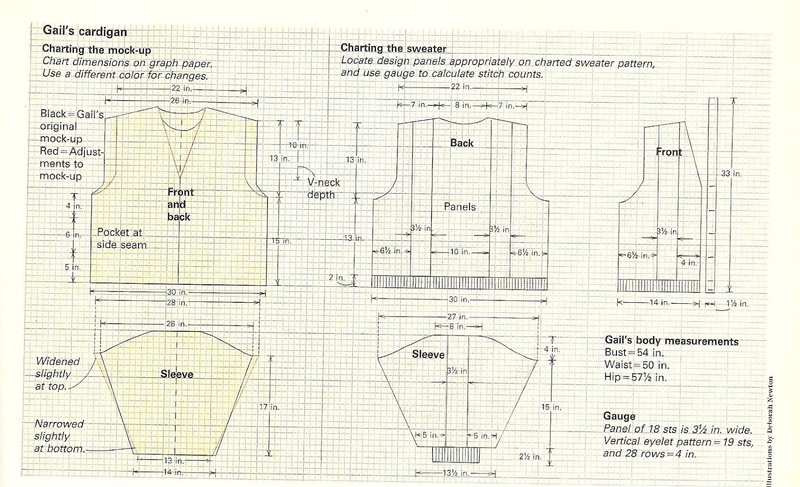 If you want to explore this further try making either a life size paper or fabric mockup of the schematic of a pattern you want to knit using the measurements for the size you have chosen and analyze it in relationship to the intended wearer of the garment.